Great people do not complain – they convert obstacles into opportunities – this man said ‘he was able to concentrate on his studies, as the light focussed on the study material’ – can you imagine – he was referring to poorly lit place and him studying in oil lantern barely able to provide light to the book and not to the room ..... yet he was satisfied with the ‘lead kindly light’ that provided just enough for the book to be seen. I was too impressed, so were the others .... the programme had been arranged to showcase role-models for students – I certainly saw him as a great role-model. The occasion was Educational Aid Function of Srinivas Youngmens Association (SYMA) on 12th July 2014 – the venue ‘memorial of Great Patriot Mahakavi Subramania Barathiyar’ ..... every year SYMA distributes uniforms (around 1200 sets) to school children, honour the school toppers of various schools in Triplicane, extend financial assistance to some students and honour a good social worker with ‘SYMA Sewa Award’. The iconoclast, a great visionary, Barathiyar sung about freedom and education and the memorial of the revolutionary was the right platform for continuing his ideals. Every year we have eminent people who have excelled in life – ensuring that students feel encouraged by great role-models. 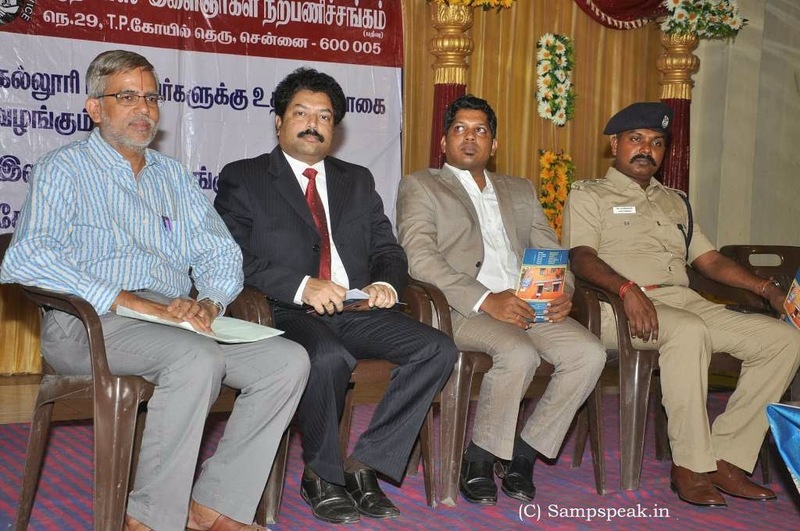 This year the Chief Guest was Thiru V. Balakrishnan, IPS officer – more about him in a separate post. There was this gentleman on podium on whom this post is centeric............. his speech was heard with rapt attention bringing out tears. He is an entrepreneur, social worker who has risen from very low echelon. He is a Chemical Engineer from prestigious BITS Pilani, MBA from IIM Ahmedabad, joined Polaris but to chose his own Company in a field too well known to him. Amongst the various accolades, CNN IBN honoured him as ‘Young Indian Leader’ – others so recognized being Anil Ambhani, Rahul Dravid, Mahendra Dhoni and Shahrukh Khan. He is Pepsi MTV youth icon. He is one of the top 3 Young entrepreneurs selected by World Bank to address on Youth and Unemployment 2012 in Washington DC. He now heads a 8 crore + company. He is Mr Sarathbabu Elumalai, who was born and brought up in a poor family in Madipakkam. His mother was a worker in Anganwadi (sathunavu koodam) who ran a roadside idly shop. From his young days, he experienced the difficulties of poverty and rose struggling at various phases. Popularly referred as ‘Food King’, he runs a food catering service which services many IT firms in many cities. To him, a lot of people who work in the food business come from the weaker sections of the society and his mother is the most successful entrepreneur who brought up her children in the face of adversity. Now he perseveres to provide food and uplift people with a great vision of seeing a hunger free India. Towards that aim, he is willing to work in a larger platform with likeminded organizations. Despite all his achievements, this man who now drove a BMW to the venue was most humble. His language, style and more importantly, the truth behind whatever was being said moved the audience – the students, the parents and significantly the organizers too. It was an object lesson of a man rising from abject poverty to great position in life, striving to make the society a better place, the ideals for which SYMA too is striving. His experiences of going to school, having to live without food some days, difficulty in paying school fees (the support of locals in paying that), having had to share small space with family members, reading in oil light (no electricity at home) made audience cry at heart. There were many days when he had to forego lunch and days when no dinner was available – they made a living by selling food items, the family would sit by and help the untiring mother who made food and perhaps finished the day drinking only water. He was unsure of paying school fees in time and sometimes underwent punishment for not paying in time. Faced the tribulation of buying study materials and good clothes. The poverty and circumstances would only have made people depressed, cursing their misfortune, envying others and ending up in misery ..... not this man, who rose fighting against all odds. Determination, will to succeed and sheer work were to take him to great heights – the man remembers his past, narrated his tribulations – not for sympathy, but to showcase that determined iron-willed people can succeed. He left an indelible impression in our hearts. The man who now gets paid many thousands for his speeches in various Organisations and Universities, expressed his willingness to motivate more school children – without any fees and in fact offered to help any underprivileged children. It is SYMA’s fortune to be associated with such great people and we felt immensely satisfied in having him on the podium distributing the Certificates. 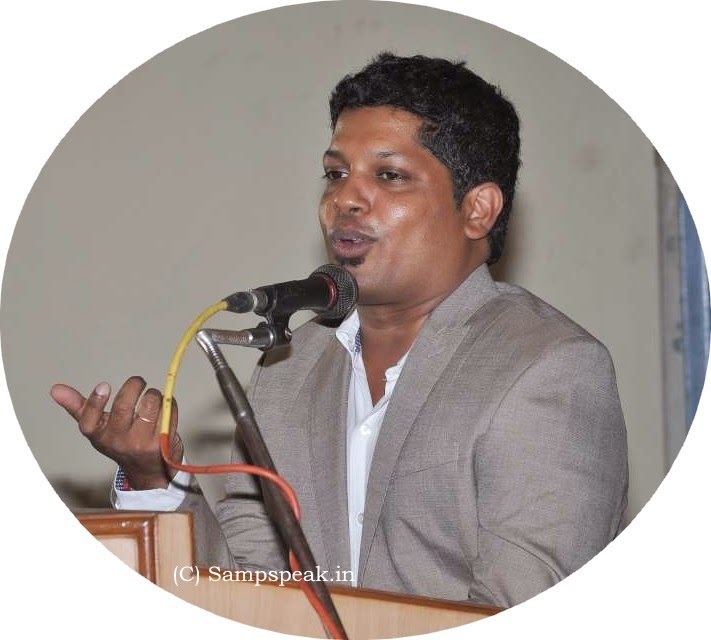 Not just another day – a special occasion for SYMA – not simply the Function – the happiness is getting associated with a good personality and in showcasing the right role model for the students to emulate. Feeling happy to be associated with such Optimists…..